This week I concentrated on some smaller issues I wanted to get fixed in the game. I fixed the route object to properly display the bouys. The script scrInitDevices() was changed back to its start version. All the test devices are removed and you start the game with no devices installed. 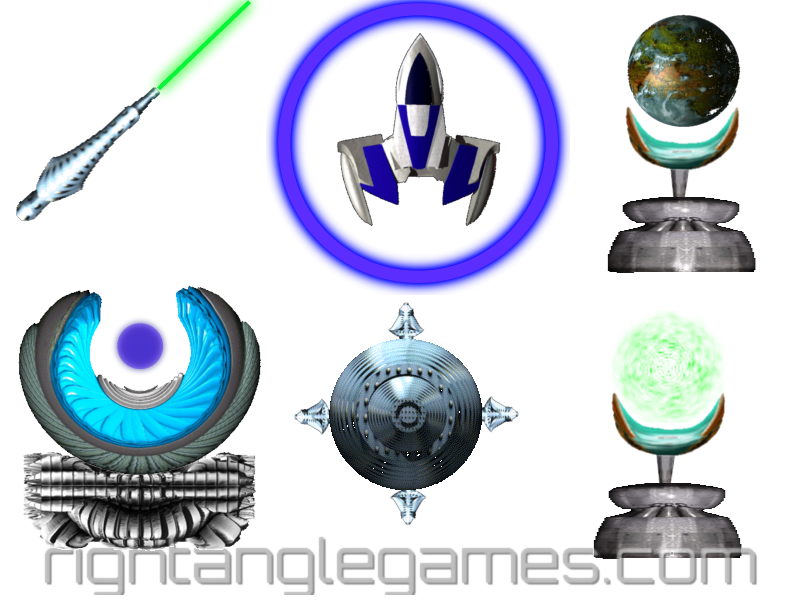 To enhance the amount of graphical eye catchers I added some animated vortex and alien ships to the title screen. The price of the short range scanner was fixed - 100 Credits is way too cheap for this helpful device. I also improved the visual representation of the attacker paths during phase 2. 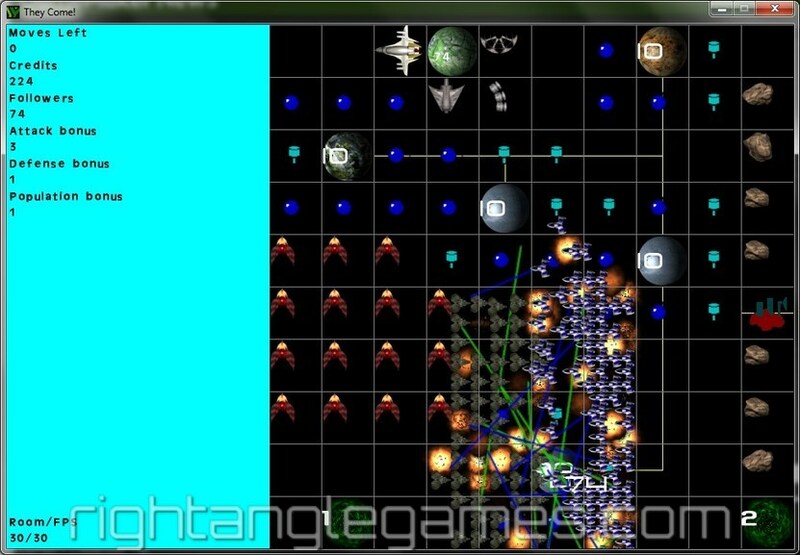 Now you'll see moving arrows that show the path the alien fleet will follow during their attack (see the attached image). The "Exit Game" buttons were removed from all rooms except the title screen. I want to avoid that the player accidentally leaves the game. Finally I updated my UI to version 1.2 of the GUI Widget library from nailbuster.com. That worked like a charm and didn't require any code change. 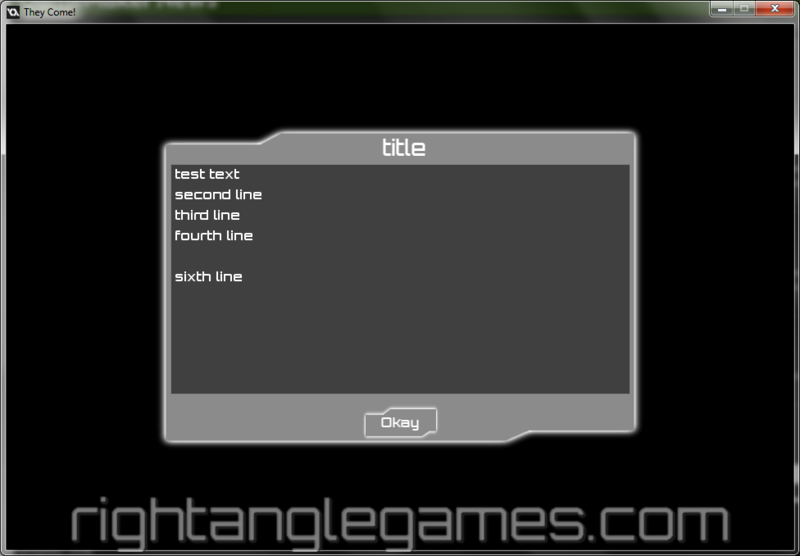 I can only recommend this extension if you want to create nice user interfaces for GameMaker:Studio without trouble! To the handful of people that received the link to the Android alpha test build - the current version is available under the same URL. To all the other people that would love to give the alpha a try: feel free to contact me. At the moment I would say a release in 2014 is to be expected. I will definitely try a commercial route. My current idea is to sell the game at least for Windows and Ouya. An Android version will contain some IAP solution. You will need to pay a small fee to get access to the full version. Other platforms (Mac, Linux, IPhone/IPad) might follow if I can afford to buy the required devices and developer licenses. 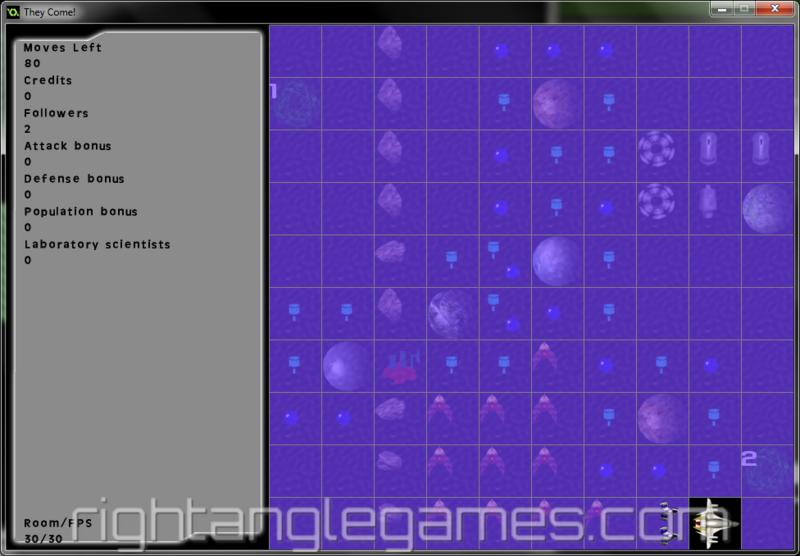 The last few weeks I tried hard to add procedurally generated nebulae to the game. First I tried my existing midpoint displacement algorithm. I was not satisfied with the speed (3 seconds on my laptop for a 512x512 pixel image) and the color distribution was also way too simple. Next thing I tried was Perlin noise. That was even slower (30 to 60 seconds for 512x512 pixels). Some smart person (Revel) on the GMC (Game Maker Community) started a new topic just in time - covering simplex noise, similar to Perlin noise but much faster. So after several weeks of coding, trying, recoding, retrying I've decided to pause a bit regarding space nebulae. An interesting idea I will follow over the coming weeks will be to use my own midpoint displacement stuff which is still the fastest approach and generate a bunch of smaller images (256x256 pixel). Those will then be stretched, rotated and colored and randomly placed with some additive blend mode to create nice backgrounds. I'll show you how that'll look when it's done. To progress with the game I coded modal dialogs which will be used to tell the campaign story and to guide new players through the (optional) tutorial. Finally I replaced the boring route lines with nice blinking pylons/buoys. Screenshots of the dialog and buoys are below. [GameDev] Devices are done, nebulae are to come! Even the last 2 and most complicated devices are implemented now. It was in fact pretty easy to get them built into the game code although their functionality is "spread" across the game. You buy the device in the shop as usual. So I need a method/script to ask: does the player have this device installed? During the procedural level generation I call this script to prepare the generated vortexes to be able to be covered with a number of mines. When the player later on discovers the vortex by clicking on it I need to place the vortex mines and get them drawn. Of course their position is random on the vortex tile. And they do rotate of course. At different speeds and different directions. Because I can. Much later, in phase 3 of the scenario, when the aliens enter your world by flying through the vortex some of those aliens will be destroyed. Which means I need to check if the vortex has been found by the player, iterate over the mines and calculate their damage on the fleet and so on. So I need to place explosions where the mines have been, remove some alien ships from the alien fleet and proceed with the game. All of that for just one ingame device - phew! I calculate the length of the laser beam but because there are two similar functions I used the wrong one (Murphy's law). One function calculates the distance between two x, y coordinates (which I should have used but didn't) and one calculates the distance between an object and a x, y coordinate. Unfortunately the second function calculates the distance from the edge of the bounding box of the object (space ship) to the given coordinate. Which resulted in the laser beams always being too short...sigh. Finally I replaced some graphics (the satellites) with better ones. Next task will be the generation of the space nebulae for the background of the playing area. My biggest concern is the performance impact on mobile devices. So I will code it and if it is too slow to be executed on startup time of the scenario I might precalculate some backgrounds under Windows and add them as images to the mobile version of the game. We'll see. 9 of the 11 initial devices are fully implemented and working fine! Only two are left, the asteroid destroyer and the vortex mines. Both devices require some more complicated implementation. 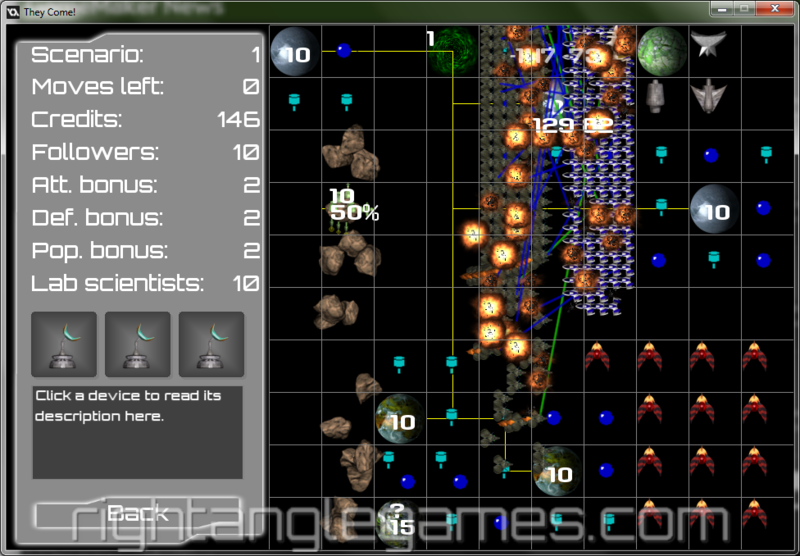 For the asteroid destroyer I need to create a laser beam from the player's ship, an explosion and I have to transform the asteroid into some empty tile. For the vortex mines I need to add some mines on top of a discovered vortex and later on, when phase 3 starts and the aliens pass through the vortex into our game world, some of them need to explode because they are destroyed by the mines that are lurking for them. The bug with disabling widgets was fixed very fast by David and I got a quick update of the uiWidgets code - thanks a ton, David! So the shop is also working properly now. The todo list is still pretty long and I expect I'll have enough remaining work for the rest of the year. I could start complaining about being busy in real life and all that but as it seems to become a standard obstacle for my game development time I just stop here. So I'd better tell you what I did achieve in the last 4 weeks. I bought the music from Imphenzia and replaced the watermarked tracks with the proper ones. The shop is pretty much finished regarding implementation. There is one bug left but that's mainly an unexpected behavior in the uiWidgets stuff which prohibits widgets to be disabled under certain conditions. What else? I started to draw the devices (or better assemble them from parts of the ShipMaker pack). See the image on the right. Some devices already have a working implementation so they start to become useful. I'm afraid their pricing will be one of the most important factors when tweaking the game balance. Adding the functionality of the first devices shows how easy it is to add features to a game using Game Maker:Studio. Another huge addition was the exCamera extension of @alexandervrs. It allows to add camera effects like scrolling, fading, tilting, flashing, shaking and zooming for a Game Maker view (a specific area on the screen). Using this extension I can zoom the camera into the battles and I will use it for more effects later on. You can make the camera follow a given object so I used my tweening code to smoothen the camera movement while following the battles from planet to planet. Looks pretty cool! I am still thinking about how to monetize the game later on. Should I do a HTML5 version or not? Distribution via clay.io and using their social and monetization features? Should I release two Android versions - a free one without the shop features and two player mode and some in app purchase to buy the missing features? Or just a paid version? What about Windows? Distribution via Desura? Is it worth creating a Linux version? And again a long period without any update. I was pretty sick for nearly two weeks and am just back at work which requires much energy to get up to speed again. But of course I wasn't resting the last 4 weeks without website update. Rearranged the summary screen that appears after each scenario and started a shop screen where you can sell and buy devices for your player ship. Below you can find some updated screen shots. My latest toy is Magix Music Maker Jam, which is available for Android and IThings. The app itself is free and so are a few music styles. If you want more different music styles you'll have to buy them for 3 Euro each. Additionally you can "upgrade" your music styles to a commercial license (which will cost around 7 Euro) to use the created music tracks in your commercial games for example. Just like every other Magix Music Maker software it works by arranging prerecorded loops. You can have 8 parallel tracks/instruments/samples and create many song parts each made up of up to those 8 samples. But the feature I liked the most is that you can in fact "jam" around. Just preset one song part with 8 instruments, activate the ones you want to start with and set the current song part to endless loop. This way you can play around with your 8 tracks, replace the samples on the fly using some up/down buttons, add some funny sound effects and so on. You can even record your "live jam" and if you disable the looping at the right time with your starting samples active you get perfectly looping music tracks for free without any problem. 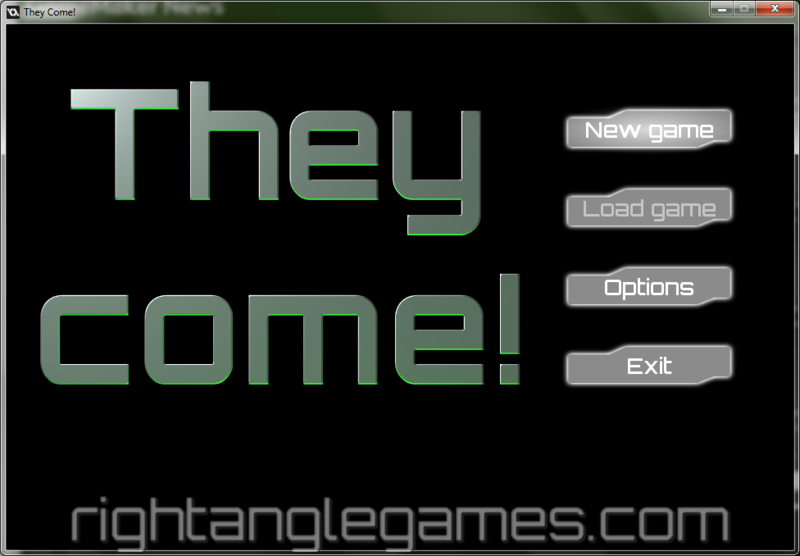 The last days I merged David's GUI components for GameMaker into my game (They Come). It worked pretty smoothly and I decided to start with a title screen to test creation, animation and behavior of the buttons. Additionally I wanted my own sprites for the buttons. See the result below. And trust me when I tell you that using these GUI components is so easy - simply amazing! The title itself is ugly as hell and just a placeholder so please have patience, it will be replaced! The animation of the appearing buttons is nice but of course you can't see it on the screen shots - you'll have to wait until I post another video! Next thing I tried to draw was the hud - again have a look at the left of the second image (the ingame screen) where you can see the hud. I think the title screen buttons and the hud are simple but look okay. What's your opinion? By the way: button and hud were created with Real-DRAW Pro, a very powerful graphics program! [GameDev] When do They Come? It's been quiet regarding game development here, I have to admit. But I wasn't lazy. I finished phase 3! 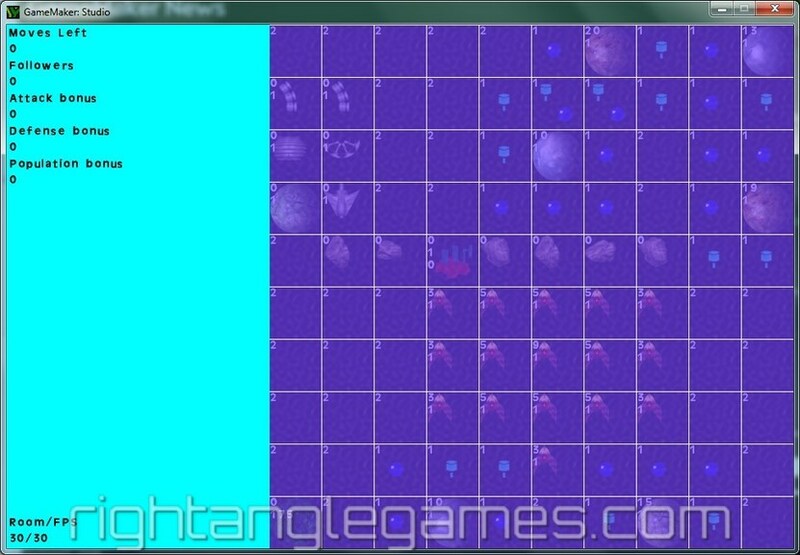 And while I was coding and playtesting the game I also fixed a lot of bugs that occurred during testing. I have now reached the point where a randomly generated scenario is fully playable! and you can spend your reward on ship upgrades (devices) that help you in the next scenarios. But there I was again: GUI features where required. And although I started to code my own GUI stuff it didn't have all the features I wanted and it took time. So you can imagine my relief when I found this post on the GMC. Some nice guy currently develops a UI library which fits my needs exactly! 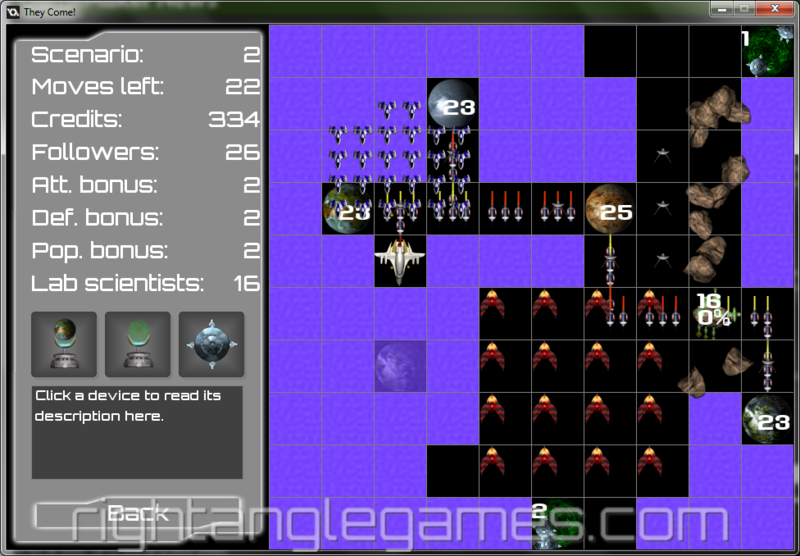 You can read some more details about the features on David's website for the library: GUI components for GameMaker. Now please excuse me, I have some integration work to do! [Website] Huh? Everything looks strange? Yes, I did it! A new website design for me and all of you is alive. But I did not switch the Creation tool - I'm still using TOWeb - but I switched to the newest version 5! To avoid keeping my site without any update for a too long period I decided to release the migrated website with first changes as is. This will mean that some things are ugly, broken or both. If you are in urgent need to get some stuff fixed as soon as possible feel free to contact me. For those who mainly read my blog posts feel welcome on my pages in their new look. The big advantage of version 5 of TOWeb is that it's based on CSS3 and HTML5 and "natively" supports all resolutions and devices. So you can now enjoy this site with your desktop browser, your tablet or even your smartphone! Phase 3 is nearly finished. winning conditions for humans are detected. general code cleanup and simplification. The only thing missing to complete phase 3 is the super weapon of the player's ship that can destroy remaining aliens after they conquered all human planets. 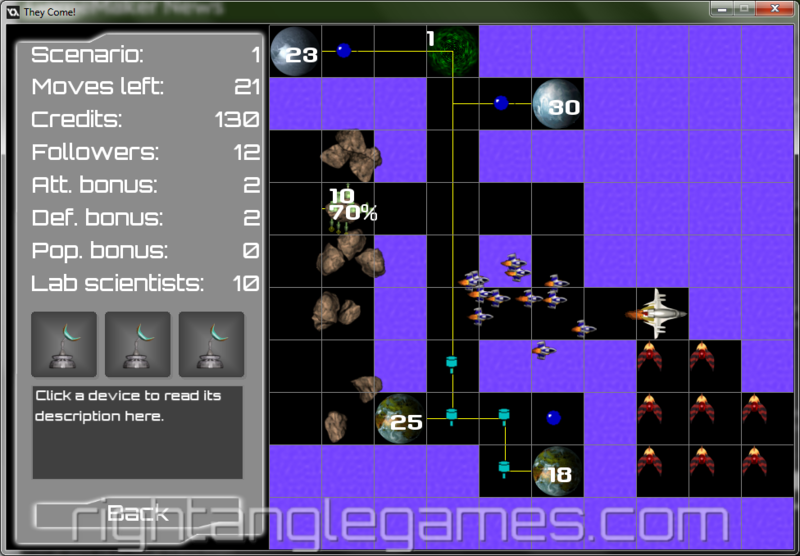 This will only work of course if the player has enough credits to use the super weapon! Otherwise the game is lost. The UI is also on my current todo list - having menus, buttons, texts and so on gets more important now that phase 3 nears completion. Because at the end of each level you will come to a score screen where you will receive your reward in credits and be able to upgrade your ship to prepare for the next harder level. This will be uploaded when phase 3 is done and I can demo a complete level play through. What did I achieve during the last two weeks? the battle happens in turns of 2 seconds with visual updates in between. Now it's finishing the rest of the battle phase (moving from planet to planet, let aliens spawn from second vortex if it exists after first alien fleet is destroyed and so on). This will take another few evenings. And then I think I'll start with some UI stuff, add some more functionality and the rest of the list from my previous post. But I'm pretty happy so far! The most complicated stuff is indeed done now! My confidence grows that I will finally manage to finish this game! And just for the record: GameMaker:Studio is awesome to work with! Even if I miss some stuff from Java, Object Orientation and my favorite Java IDE Eclipse: the development speed of GM:S is impressive! I can fully concentrate on game logic and functionality. Everything else I might require from a framework or library is already there! Thanks to you guys at YoYo Games! [Game Dev] Proceed to phase 3! 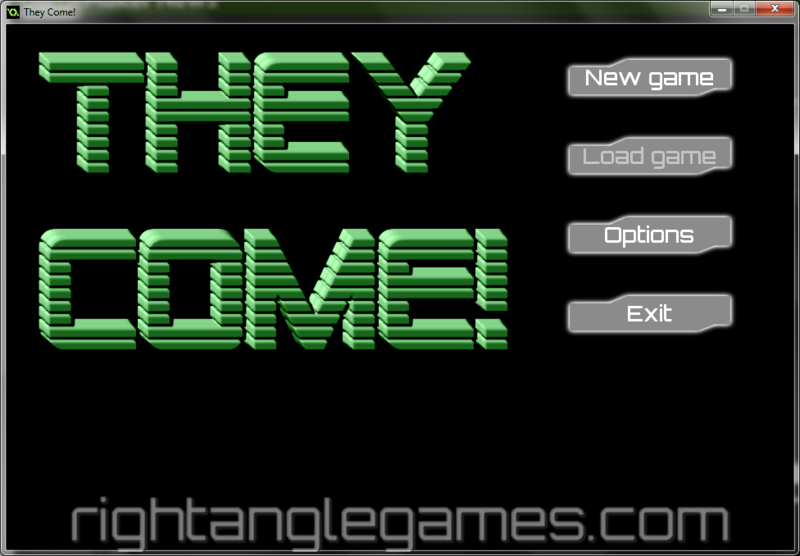 I've finished implementation of the second phase in my game They Come. You can now use a given amount of time (currently 10 seconds) to arrange your ships across your connected planets and prepare for the alien onslaught. Some minor tweaks need to be done (like adding your follower fleet to the first planet) but those should be simple to do. fleets following the calculated paths between vortex and planets. if the random number is less or equal the attack value the attacker wins the fight and the defender is marked as "to be destroyed", if the random number is bigger than the attack value the defender wins and the attacker is marked as "to be destroyed". Seems like a good first approach. [Game Dev] I'm the master! So I've got all available cross platform modules (right now supported platforms are Windows, Windows 8, Windows Phone, Mac, IPhone/IPad/IPod, Android, HTML5, Ubuntu Linux). Additionally I will get all future modules for free! More info on the roadmap. So you're getting interested? Why not spend 300$ and get all of that for yourself right now? Right, even if you don't own any GameMaker stuff, you can currently buy the entry professional edition of GameMaker:Studio for 99$ and use the current upgrade offer to the master collection for 199$. So for 298$ (you might have to add some VAT) you're in the game! But hurry, the upgrade offer is only valid until March, 31st! [Game Dev] Planets, vortexes, routes and more! Oops, seems I missed a post last week. Real life kept me busy so I didn't find the time and I had not very much to report. It's better this week - my mojo was pretty high and I tried to work on They Come as much as I could in the few spare evenings. So I fixed the floating popup texts which appear now centered at their position and start to float up slowly and get more and more transparent until they disappear - just like I wanted it. The first phase (exploration) of a scenario is mostly complete now (except all this fine tuning of course) and working as expected. 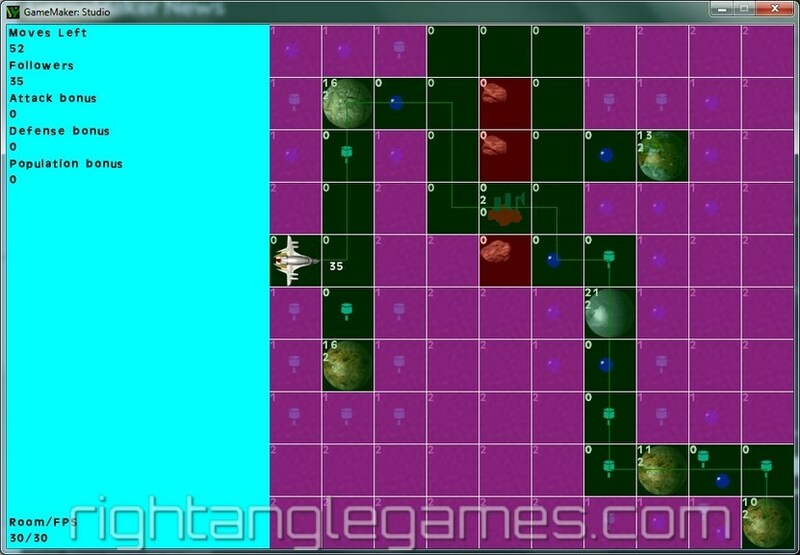 After your 80 moves/turns of uncovering the map the second phase starts - the arrangement. 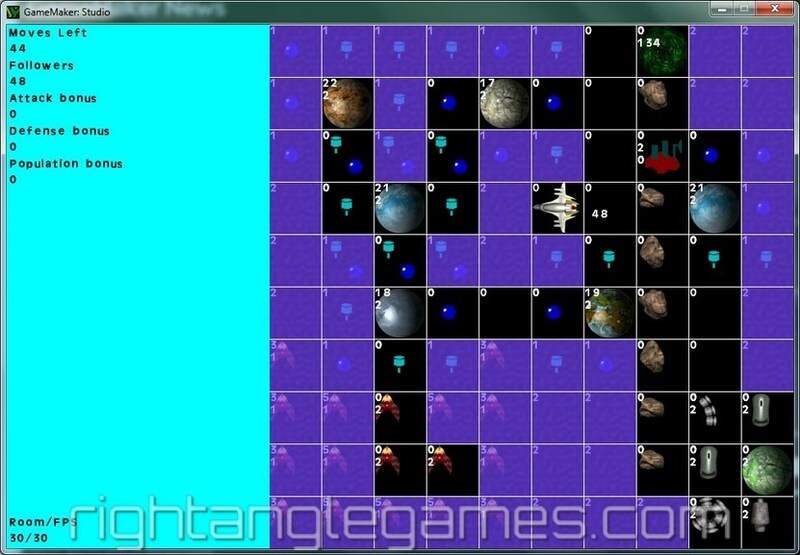 Here all remaining tiles will be uncovered and you have ten seconds left to arrange your space fleet and split them between all connected planets to defend them against the arriving aliens. 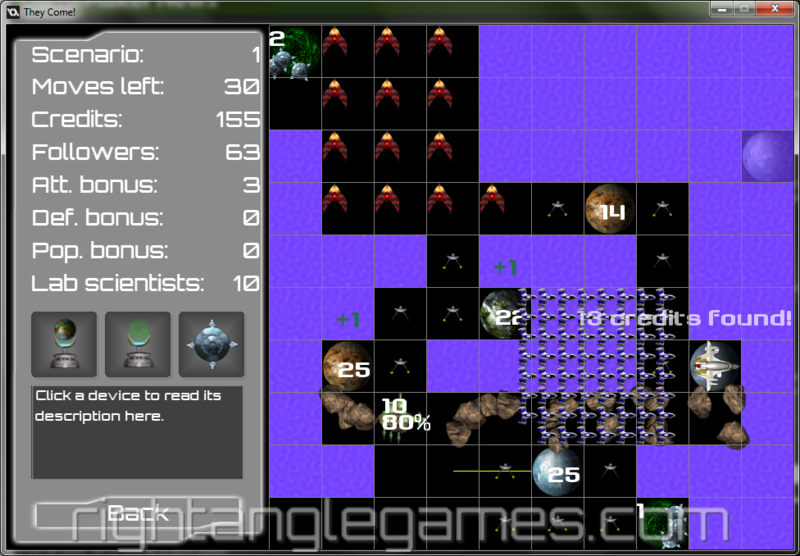 Right now uncovering the tiles is implemented and the countdown from 10 to 0 is also functional. Moving ships between planets is not yet done. But that shouldn't be too complicated. At the beginning of the third phase the aliens will appear through one or two worm holes or vortexes and head to the nearest planet and attack it. If the aliens overrun your defense fleet they occupy the planet and head for the next nearest planet. The path calculation (from vortex to nearest planet to nearest planet to nearest planet...) is done and working. 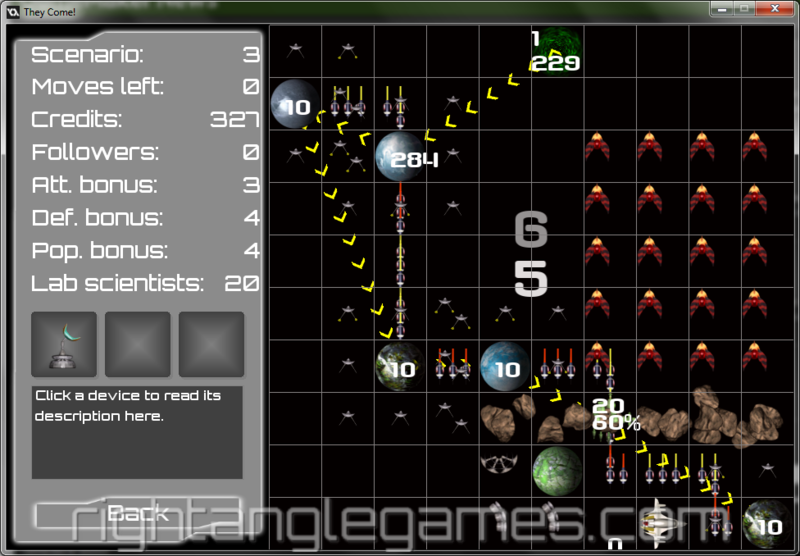 Now I just need to nicely visualize them and implement the third phase - the space battle! But for now I declare this day finished - time for a glass of wine or a little dram of whisky. Nearly no time found to work on They Come. But I managed tiny bits. I added credits (money) to the game which you'll need later on in the game to buy upgrades for your mother ship. 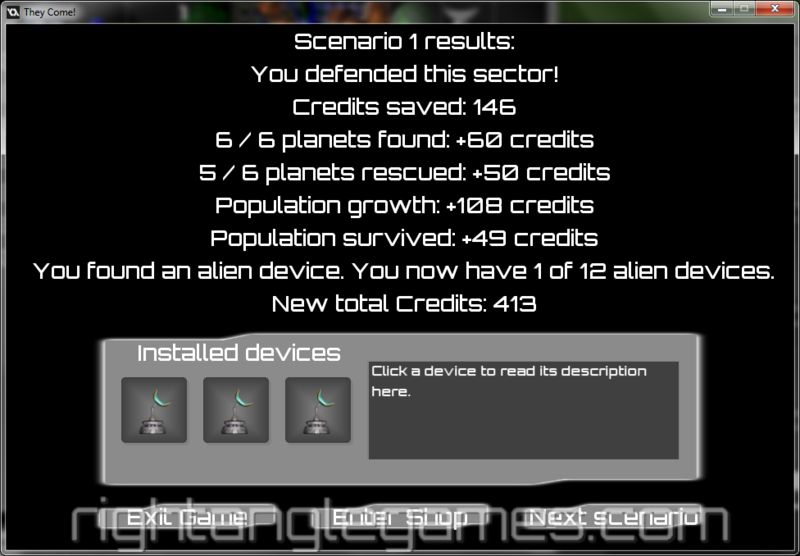 I also finished planet behavior: you can search planets up to two times to find credits and some bonuses for population increase, attack or defense values. I also bought a Midi controller keyboard to start dabbling with some music (I own Magix Music Maker for several years now, upgraded once in a while but never really used it). Now playing with Magix Music Maker is a completely different story. All those plugins and synthesizers are fun to use because you can record live! [Game Dev] The fleet is moving again! That was a tough one! It took me the whole afternoon (round about 4 hours) to get the fleet code working properly (at least for the first working version). But it's in now with correctly rotating fleet ships staying in their formation. To celebrate I uploaded a YouTube video which you can also find in this blog entry. [Game Dev] Routes are mine! It worked exactly as I described it in the previous post - I create space route objects on those tiles where a route is allowed. The space route objects know how to draw themselves (based on their neighbors) - right now they draw simple yellow lines. Later on I will create some buoys or waypoint lights which blink every once in a while instead of those boring yellow lines. 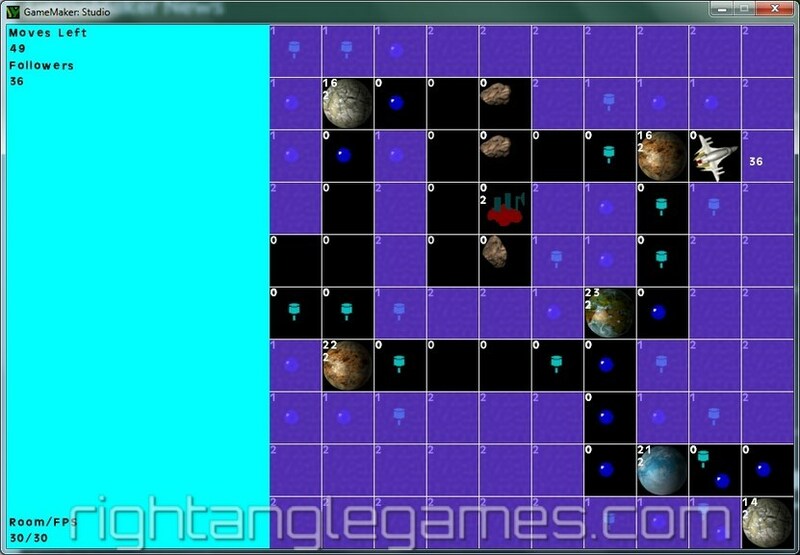 You cannot build routes on all possible tiles - there will be no routes across asteroids for example. And you can only establish routes if you have enough followers. The amount of required followers for each route segment is based on available devices that you can buy to enhance your ship. If you compare the last two screenshots you can see that the random level generator is indeed working fine too! [Game Dev] Java code porting is done, but..
All the relevant Java code is now ported over to GameMaker's script language GML. Overall it was a smooth and simple process. Next task is to get everything into a working state again. 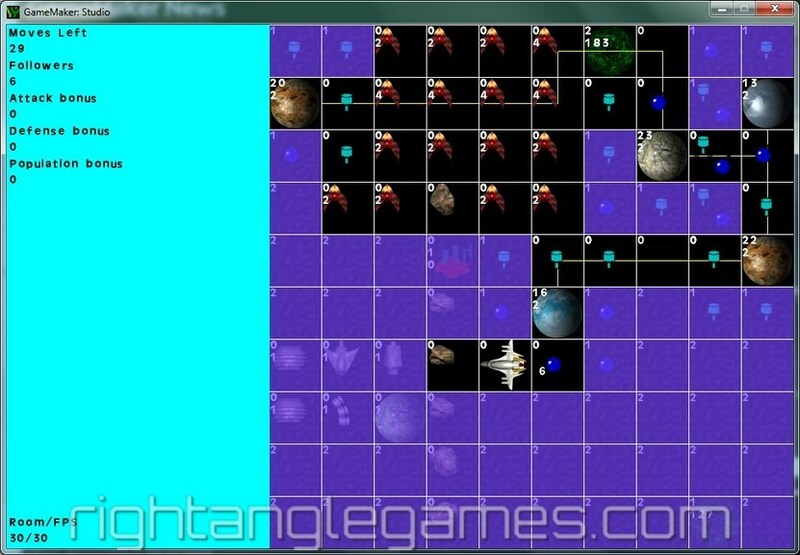 While I was porting the code I had a vague memory of some existing functionality to draw space routes which can exist between planets and increase population growth of those connected planets. This morning I detected that I completely forgot another WIP of They Come I've started with BlitzMax back in 2009/2010. Sigh. But this time I will solve it different, not just drawing lines but having SpaceRoute objects on top of the tiles where the SpaceRoute objects know how to draw themselves. Screenshot of current WIP state to the right. So I'm still porting Java code over to GML. It's not complicated at all, just tedious. You cannot use return values of scripts in expressions. You cannot create arrays in scripts and return them - they are lost because they are in the local scope of the script and don't survive just because they are return values. The script editor gets totally confused if you paste code into it containing real TAB characters. Don't do that. But in general it's very easy to modify the Java code base to GML. Just a few scripts are remaining and then I've got the old functionality of the Java prototype back. On the other hand I already improved the scripts a bit while porting, added new graphics and due to GameMaker's nature dealing with events, drawing, attaching sprites and all that is way easier than before. the code editor window was modal!!! This meant you could not open several code editors at once, you could not copy from one code editor window into another without closing and opening them one after the other! That has been a real PITA for years now and I'm so happy that they finally got it fixed! You cannot see very much because of the fog of war but there are a lot of new game elements added (and now placed randomly) to the map. While I'm still porting the random level generation stuff over (I'm just too tired at night on working days right now so I mainly try to get things done at the weekend) every once in a while I think about music. Just recently I bought Caustic 2 for my Nexus 7 tablet. It's a wonderful pattern based music creation tool, based on synthesizers you can customize to your liking. There are additional presets you can buy if you don't want to detect synth settings on your own. The best thing is it's also available for Windows machines. So you can share the stuff between PC and tablet. Cool! Another website I've heard about on twitter is http://incompetech.com/ where you can get free music. A donation of 5$ per track is highly recommended and if you've listened to a few tracks you'll have to agree that they are all worth it! But officially all music tracks are under the Creative Commons: By Attribution 3.0 license. This means you have to credit the author in your game, video or whatever you want to produce with it but you are not forced to pay for the songs. Still I can only urge you to donate the money - I've paid money for songs not even close to the quality of the ones from Incompetech. Over the last week I migrated the functionality of planets and laboratories from the Java source code back to the GameMaker:Studio version of They Come. Worked like a charm. So the planets start to increase their population after they are found by the player and the laboratories start to explore technological features as soon as they get some population (scientists) from the player. Bazinga! This afternoon I started learning the A* path finding implementation of GM:S. It didn't work immediately as expected because the documentation was a bit wrong regarding path calculation. But after I found out that you have to pass absolute screen coordinates for start end target position instead of grid coordinates all worked fine. You can see some debug result in the screenshot to the right. I was very pleased when I found out that GM:S offers convenience methods to draw the grid with free cells in green and blocking cells in red and also the calculated path. Absolutely perfect for debugging issues and all you need to do is call a method/function! More progress information hopefully on the next blog post! Of course it's full of placeholder graphics, the hud is less than rudimentary but still: I make progress! The code is already laid out for multiplayer (hot seat for now), the resolution is resized to 960x640 which fits many mobile devices (adjustments using GameMaker views will come in later to support different resolutions by keeping aspect ratio). The "core" engine is basically working and I continue to transform the existing Java code back to GML, GameMaker's scripting language, which is comparable with C plus some GameMaker specific enhancements. Some months ago I bought some graphics from http://www.graphicsforgames.com, different space ship fleets and planets and asteroids for They Come. Just yesterday I finally managed to convert them to a usable size for the game. Next thing would be recoding the game for GameMaker:Studio with stuff like multiple platforms in mind. This means multiple resolutions for example. Also I learned quite some stuff about GM:S' features and functionalities and I think I can convert the existing Java code base to GM:S pretty well and on the way add many little gizmos to the game. Sigh, three months without any update - what a pity! As some of you have heard I got a new day job which requires a lot of time and energy. So my spare time for the website and game development is reduced. I'm pretty sure this will change over time but at the moment it's a situation I have to learn how to deal with. But nevertheless, a happy new year to all of you, keep fingers crossed for game dev time and all the best to you!